Luke ~ The second day always seems the hardest. When starting a new adventure, it usually takes me a day to begin to hit the rhythm of the new routine. The long, complicated journey from Seattle to the Everest region ensured that the first day of trekking was a bit of a blur. By the time we started up the trail on day 2, the reality of the trip finally started to settle into my simple brain. Glen started our day by describing the route to all of us over breakfast. This was a morning ritual that began more formally (with a mini white board and contour maps) and gradually loosened up throughout the trek as we all got the hang of things and began to realize that the map was about as accurate and precise as something that may have been drawn up on a napkin in a Kathmandu bar… Thankfully, Karma and the rest of the staff showed their worth time and again along the trail. It seems they had every turn, rock, and stream memorized as well as the backs of their hands. 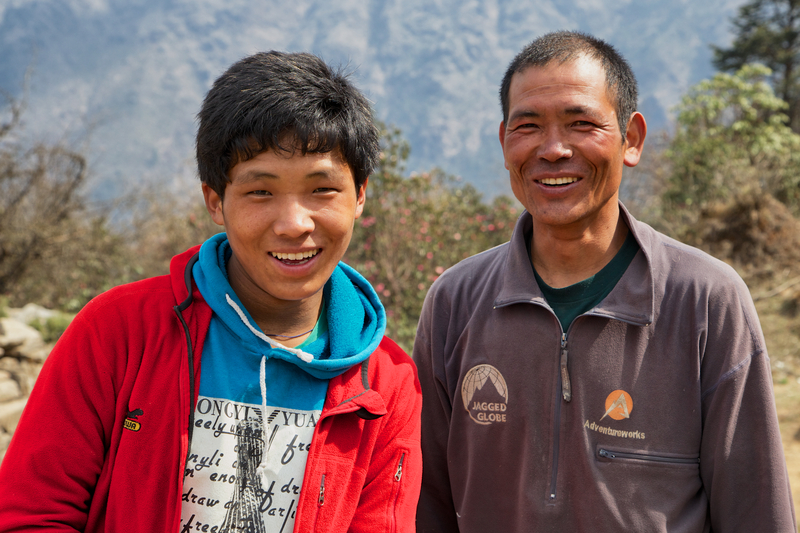 Tsongba (son) and Pasang (father) made a wonderful porter team. They were the two who Christen and I hired to carry the myriad of camera and personal gear we needed to make the film and keep us warm and safe. 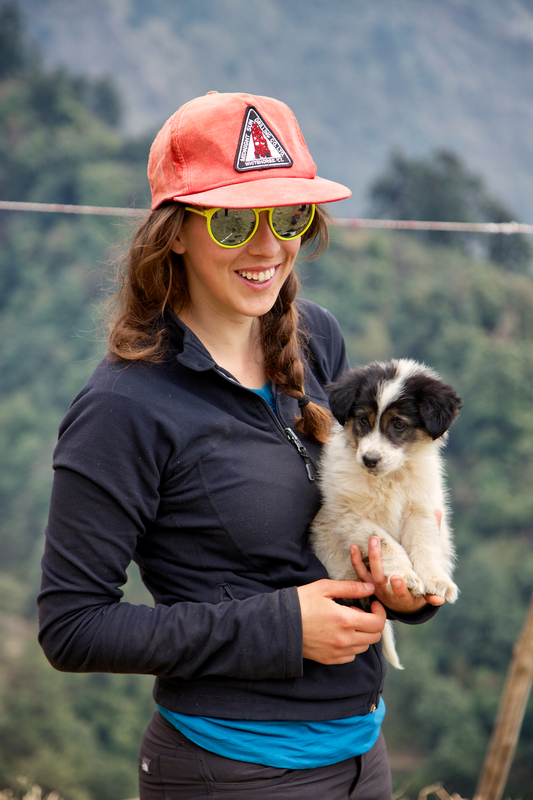 They began as our porters and quickly became our family too. The day was to start with a 3-hour climb up a high ridge (about 2500 ft gain, if I recall) to a pass where we would have tea. The main trail had been recently washed out in a storm, so we would have to take a much steeper trail, practically straight up the ridge. 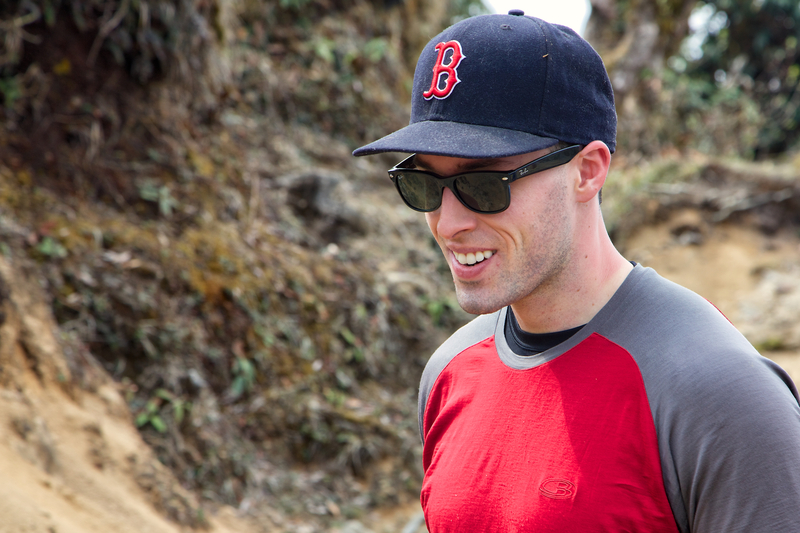 Christen was all smiles as we began our hike in the morning up the high ridge. Andrew was just getting warmed up by the demanding morning. Rose was always finding puppies along the way. This one was at the top of the pass where we had tea. After lunch, there would be a couple more, slightly smaller, ups and downs until to our destination for the night. 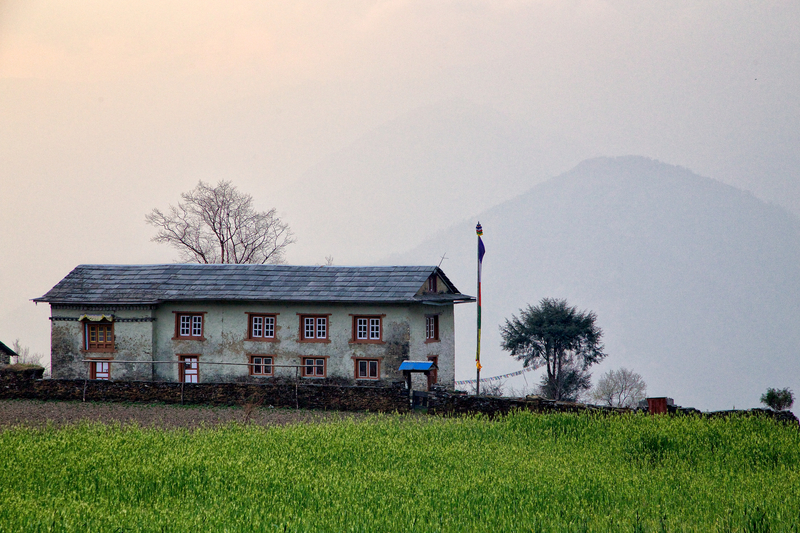 We were to stay in a home in Pangom, about a 30-minute walk from a monastery where Karma’s uncle is the Lama. We saw no other tourists throughout the day. 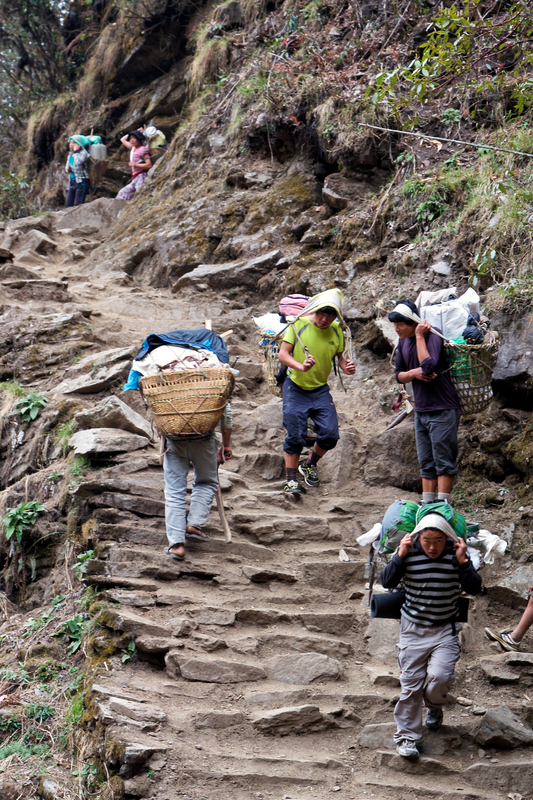 However, we did see many local villagers carrying all sorts of loads on the steep trails. 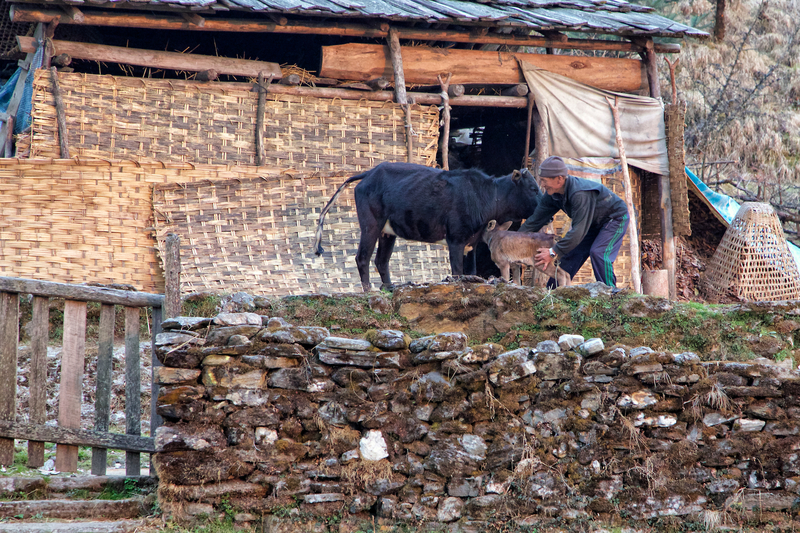 The cargo on their backs varied from huge baskets of piglets to firewood. Their way of life makes even the most demanding American life look easy. Local villagers go about their day carrying huge loads between villages. Glen explained before the trip that it is not a question of if you get sick in Nepal, it is a question of when. I guess I must have wanted to get it out of the way early, because I was feeling terrible all day. I had picked up one of the dreaded digestive system bugs. After much discussion at the meal table about how everyone’s stomach and bowels were doing, Glen made sure I started my regimen of Cipro (warmly referred to as ‘Vitamin C’ during the trek) and Imodium. When I mentioned earlier that the reality of the trip was setting in, I meant that day 2 took on the tone of “Wow, I have some really tough hiking to get through, and I already feel like my body is revolting to the concept.” Oh well, all you can do is take it slowly and enjoy the view. 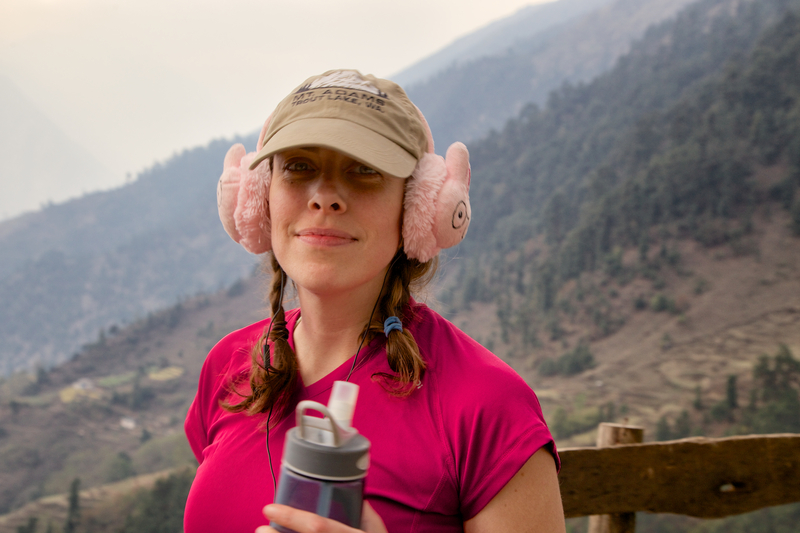 Christen’s strategy of putting on her bunny ear muffs was a good one for feeling a comfort from home when utterly exhausted after a steep climb. As I brought up the “caboose” into Pangom, as Christen liked to call our habitual place bringing up the rear of the party, I never felt more happy to reach a destination. Each stop along the way felt more separated from the hectic life in America. I was finally earning my place, however temporarily, in a simpler life. As I settled into the daily ritual of washing my feet and socks, I looked out over a sun-swept terrace of buckwheat. My body was aching from whatever bug I ingested, but my soul was beaming with peace. This was my view as I washed my socks. The homeowner we stayed with helping his calf get some of its mother’s milk. Previous PostLuke ~ Coming up for airNext PostLuke ~ Sibuje, here we come!